Since the Xmas break, everything has been action packed! Many of you have followed my 'blow by blow' adventures on instagram but I know there are many more waiting to read the adventure here on my blog. Extra exciting opportunities arose creating a very tight mentor schedule. Due to the limited time and wanting to present an in depth account of my mentorship, I haven't published as many blog posts as I would have liked. I am currently sitting in Design Festa Gallery East 102 at my '‘Sofubi and character work study tour: Conclusion exhibition' and I thought I would give a little 'gap filler' catch up post! Below is a list of all of my mentors and a brief description of my study with them. 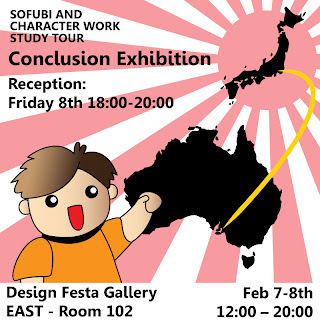 If you are in Tokyo, please come and say hello! Going back to my retail roots, I assisted in the daily activities of running a gallery shop space. I discovered the differences in the Japanese marketplace and left with a deeper understanding of Japanese retail practices, methods and expectations. Discussion and development of my own unique aesthetic style in regards to creating original and licensed character works. My time with Touma has spawned a separate project that will be revealed at a later point in time. ‘Korejanai robot’ building and developing concepts for the Japanese market. During my time at ZariganiWorks, I designed and built my own ‘Korejanai Robot’ named ‘Korewado Robot’. We also discussed the methodology and practices of ZariganiWorks to develop concepts for the Japanese market. I applied my new knowledge to develop a gacha series concept titled ‘BITE’. Deeper understanding of Japanese art and design through translation and guidance. As my project mentor and translator, Teresa’s support was beyond direct translation and teachings of my mentors. Thanks to Teresa, I have achieved a deeper and richer experience throughout my time in Japan. Guidance and approach to knit my own amigurumi design from sketch. It was my first time knitting; I was able to achieve a mouth and half of the body. Sadly I injured my hand and was not able to complete during my mentorship. Dolroffo completed the design while teaching me the steps and approach. Guidance in developing new sofubi works through each stage of production. Sculpting, silicone casting, wax production, sofubi factory tour, assembly and painting. New character work Suity-chan and Kowaiila were both created under Sunguts mentorship. Discourse of personal approach and techniques used in creating master sculpts and wax casts. Many examples were given and I left with a wider view of what is possible and achievable in sofubi production that will aid me in future sofubi development. You have been a busy man, Shane!